You are cordially invited to Pratt in Venice's exhibition opening on Monday October 23rd at 5pm, featuring work and research by our 2017 alums! Come to East Gallery, 200 Willoughby Av, Brooklyn NY to learn more about the program; bid on select works in the silent auction to support the Scholarship Fund; and enjoy some fresh mozzarella and San Pellegrino with faculty and students! The exhibition will remain open Tuesday October 25 through Friday October 27, 9 am - 5 pm. We hope to see you there! Pratt in Venice Director Diana Gisolfi's new book, Paolo Veronese and the Practice of Painting in Late Renaissance Venice, has been published by Yale University Press. Pratt in Venice alumna, Cynthia S. Brenwall (PiV ‘07), has written a book, The Central Park: Original Designs for New York’s Greatest Treasure. Monique Rollins, Alumna of PIV, visits Venice in July! Faculty and students with Monique at Santa Maria della Salute! Back row from left to right: Michael Brennan (Painting Instructor), Penghui Zhang, Joseph Kopta (Art History Instructor), Michele Rushfeldt, Monique Rollins, Diana Gisolfi (Director and Professor of Materials and Techniques), Aomi Kikuchi, Chantal Kassarjian, Jenna Pasquino. Middle Row: Thea Zwier, Christian Harding, Andrea Santos (Printmaking Instructor), Alessandra Levato, Skyler Elfeldt, Xingze Li. Front row: Abby Staub, Kirsten Herman, Olivia Cranney, Drue Schwartz, Aubrey Roemer. Pratt in Venice was honored to have a visit from an alumna of the program, Monique Rollins (PiV ‘04), back in July! During our class tour of the Baroque church, Santa Maria della Salute, Monique came by to say hello and revisit one of Venice’s most iconic monuments with us. Afterwards, she joined Diana Gisolfi, director of Pratt in Venice, for an aperitivo in order to catch up! After Monique attended Pratt in Venice as a student in 2004, she returned to the program as Diana’s on-site assistant in 2007. In 2005, Monique graduated with an M.F.A. in Painting from Pratt Institute. She pursued her education further at Pratt, receiving an M.S. in History of Art and Design in 2006. Monique is now a successful artist, working between New York City and Florence, Italy. She recently had an exhibition in Beijing at the Zhu Naizheng Research Center of Art. We love having visits from alumni of the program, especially in Venice! 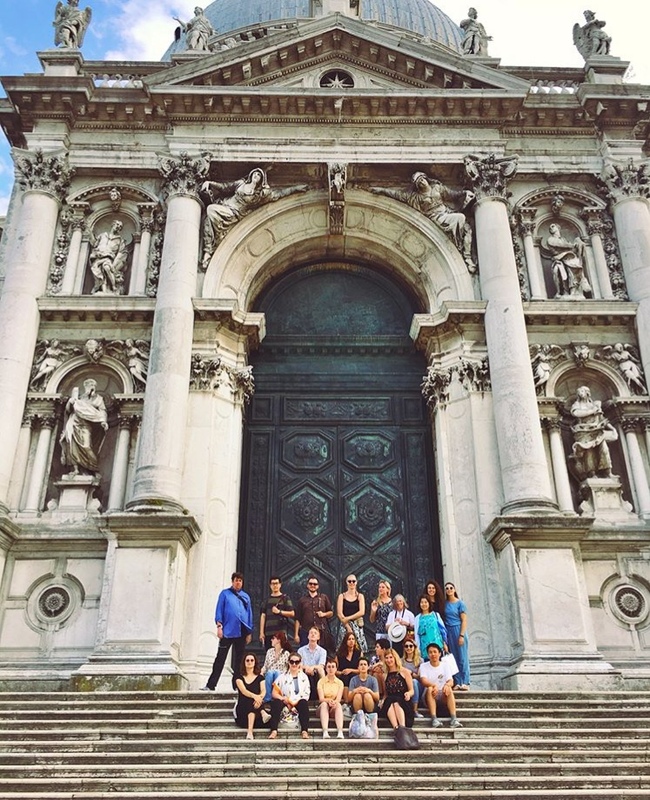 Another group photo at the Baroque church of Santa Maria della Salute! Pratt in Venice alumna Kelly Flaherty (PiV ’07) will begin a position as Drawings Cataloger at the Princeton University Art Museum in Princeton, New Jersey. Pratt in Venice alumnus Taylor Patterson (PiV '12) has illustrated a new children's book, The Sloppy Okapi, published by Yellow Light Press. Pratt in Venice alumnus Chad Seelig is exhibiting a new installation in the 2017 Idaho Triennial at the Boise Art Museum. Adèle Rossetti Morosini, alumna of the dual MS/MFA program in Art History and Fine Arts ('97) and of the Pratt in Venice program, has been awarded a Fulbright grant to travel to Rio de Janeiro this August. Paintings by PiV 2006 alumna and former Assistant to the Director Monique Rollins are currently on view in a solo exhibition at Art Central Fair in Hong Kong. 31st Annual Exhibition - Opening November 2nd! The 31st annual Pratt in Venice Exhibition opens Monday, November 2nd, from 5-7pm, in East Hall's 2nd Floor Gallery on the Brooklyn campus. Beijing Memory: Nostalgia Paintings, a solo exhibition of paintings by PiV alumna and former program assistant Monique Rollins (M.S. History of Art and Design ’ 06; M.F.A. Fine Arts ’04) is on display at the American Embassy in Beijing through the end of November. Surface has named Lilian Day Thorpe (PiV ’13) an Avant Guardian in the contemporary design magazine’s 15th annual photography competition. Thorpe is one of 10 U.S.-based photographers who received the prestigious award that annually recognizes new and emerging talent. Sculpture student and Pratt in Venice alumnus ('13) Tony Limauro (B.F.A. Fine Arts '15) referenced classical forms in the contemporary table that he created as part of his senior thesis project. Pratt in Venice alumna ('14) Megan Kelchner was honored on Sunday night in Los Angeles at the 31st annual L. Ron Hubbard Writers and Illustrators of the Future Awards at the Wilshire Ebell Theatre. The contest is specifically aimed at finding and recognizing artists and writers of the future, who have yet to be published.